What is heart (cardiovascular) disease? Who is at risk for heart (cardiovascular) disease? What causes heart (cardiovascular) disease? How is heart (cardiovascular) disease diagnosed? What lifestyle changes can a person make to prevent further heart disease or heart attack? What is the medical treatment for heart (cardiovascular) disease? How many people have heart (cardiovascular) disease, and what is the prognosis? Chest pain (angina) - This pain may radiate or move to the arm, neck or back. Treatment for coronary heart disease depends upon its severity. Many times lifestyle changes such as eating a heart healthy diet, exercising regularly, stopping smoking and controlling high blood pressure, high cholesterol and diabetes may limit the artery narrowing. While the pain often is described as coming from behind the chest bone, women are more likely than men to experience discomfort in the arms, neck, jaw, throat or back. Women often have a hard time determining where the pain is exactly coming from. The heart is like any other muscle in body. It needs an adequate blood supply to provide oxygen so that the muscle can contract and pump blood to the rest of the body. Not only does the heart pump blood to the rest of the body, it also pumps blood to itself via the coronary arteries. These arteries originate from the base of the aorta (the major blood vessel that carries oxygenated blood from the heart) and then branch out along the surface of the heart. 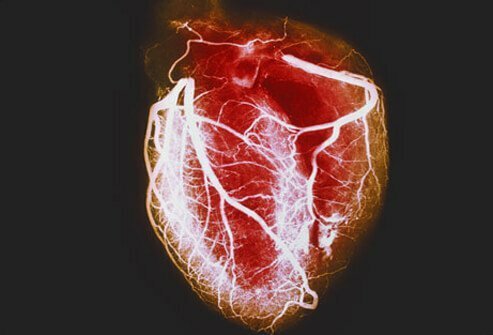 When one or more coronary arteries narrow, it may make it difficult for adequate blood to reach the heart, especially during exercise. This can cause the heart muscle to ache like any other muscle in the body. Should the arteries continue to narrow, it may take less activity to stress the heart and provoke symptoms. The classic symptoms of chest pain or pressure and shortness of breath that often spreads to the shoulders, arms, and/or neck due to atherosclerotic heart disease (ASHD) or coronary artery disease (CAD) are called angina. Should one of the coronary arteries become completely blocked -- usually due to a plaque that ruptures and causes a blood clot to form -- blood supply to part of the heart may be lost. This causes a piece of heart muscle to die. This is called a heart attack or myocardial infarction (myo=muscle + cardia=heart + infarction= tissue death). Cardiovascular disease, for this article, will be limited to describing the spectrum of atherosclerosis or hardening of the arteries that ranges from minimal blockage that may produce no symptoms to complete obstruction that presents as a myocardial infarction. Other topics, such as myocarditis, heart valve problems, and congenital heart defects will not be covered. The symptoms tend to be brought on by activity and get better with rest. Not all pain from heart disease have the same signs and symptoms. The more we learn about heart disease, the more we realize that symptoms can be markedly different in different groups of people. Women, people who have diabetes, and the elderly may have different pain perceptions and may complain of overwhelming fatigue and weakness or a change in their ability to perform routine daily activities like walking, climbing steps, or doing household chores. Some patients may have no discomfort at all. Most often, the symptoms of cardiovascular disease become worse over time, as the narrowing of the affected coronary artery progresses over time and blood flow to that part of the heart decreases. It may take less activity to cause symptoms to occur and it may take longer for those symptoms to get better with rest. This change in exercise tolerance is helpful in making the diagnosis. Often the first signs and symptoms of heart disease may be a heart attack. This can lead to crushing chest pressure, shortness of breath, sweating, and perhaps sudden cardiac death. Heart or cardiovascular disease is the leading cause of death in the United States and often can be attributed to the lifestyle factors that increase the risk of atherosclerosis or narrowing of arteries. Smoking, along with poorly controlled hypertension (high blood pressure), and diabetes, causes inflammation and irritation of the inner lining of the coronary arteries. Over time, cholesterol in the bloodstream can collect in the inflamed areas and begin the formation of a plaque. This plaque can grow and as it does, the diameter of the artery narrows. If the artery narrows by 40% to 50%, blood flow is decreased enough to potentially cause the symptoms of angina. In some circumstances, the plaque can rupture or break open, leading to the formation of a blood clot in the coronary artery. This clot can completely occlude or block the artery. This prevents oxygen-rich blood from being delivered to the heart muscle beyond that blockage and that part of the heart muscle begins to die. This is a myocardial infarction or heart attack. If the situation is not recognized and treated quickly, the affected part of the muscle cannot be revived. It dies and is replaced by scar tissue. Long term, this scar tissue decreases the heart's ability to pump effectively and efficiently and may lead to ischemic cardiomyopathy (ischemic=decreased blood supply + cardio=heart + myo=muscle + pathy=disease). The diagnosis of cardiovascular disease begins by taking the patient's history. The health-care professional needs to understand the patient's symptoms and this may be difficult. Often, health-care professionals ask about chest pain, but the patient may deny having pain because they perceive their symptoms as pressure or heaviness. Words also may have different meanings for different people. The patient may describe their discomfort as sharp, meaning intense, while the health-care professional may understand that term to mean stabbing. For that reason, it is important for the patient to be allowed to take the time to describe the symptoms in their own words and have the health-care professional try to clarify the terms being used. The health-care professional may ask questions about the quality and quantity of pain, where it is located, and where it might travel or radiate. It is important to know about the associated symptoms including shortness of breath, sweating, nausea, vomiting, and indigestion, as well as malaise or fatigue. The circumstances surrounding the symptoms are also important. Are the symptoms brought on by activity? Do they get better with rest? Since symptoms began, does less activity provoke onset of the symptoms? Do the symptoms wake the patient? These are questions that may help decide wither the angina is stable, progressing, or becoming unstable. With stable angina, the activity that is required to initiate the symptoms does not fluctuate. For example, a patient may state that their symptoms are brought on by climbing up two flights of stairs or walking one mile. Progressive angina would find the patient stating that the symptoms are brought on by less activity than previously. In the case of unstable angina, symptoms may arise at rest or wake the patient from sleep. Risk factors for cardiovascular disease should be assessed including the presence of high blood pressure, diabetes, high cholesterol, smoking history, and family history of cardiovascular disease. A past history of stroke or peripheral artery disease are also important risk factors to be assessed. Physical examination may not necessarily help make the diagnosis of heart disease, but it can help decide whether other underlying medical problems may be the cause of the patient's symptoms. Auscultating or listening to the neck, abdomen and groin for bruits. A bruit is the sound produced within a narrowed artery due to turbulence caused when decreased blood flow occurs across the narrowed area. Bruits can be heard easily with a stethoscope in the he carotid artery in the neck, the abdominal aorta, and the femoral artery .Check sensation in the feet for numbness, decreased sensation, and peripheral neuropathy. Moreover, many other important conditions may need to be considered as the cause of symptoms. Examples include those arising from the lung (pulmonary embolus), the aorta (aortic dissection), the esophagus (GERD), and the abdomen (peptic ulcer disease, gallbladder disease). After the history and physical examination are complete, the health-care professional may require more testing if heart disease is considered a potential diagnosis. There are different ways to evaluate the heart anatomy and function; the type and timing of a test needs to be individualized to each patient and their situation. Most often, the health-care professional, perhaps in consultation with a cardiologist, will order the least invasive test possible to determine whether coronary artery disease is present. Although heart catheterization is the gold standard to define the anatomy of the heart and to confirm heart disease diagnosis (either with partial or complete blockage or no blockage), this is an invasive test and not necessarily indicated for many patients. The heart is an electrical pump and electrodes on the skin can capture and record the impulses generated as electricity travels throughout the heart muscle. Heart muscle that has decreased blood supply conducts electricity differently than normal muscle and these changes can be seen on the EKG. A normal EKG does not exclude cardiovascular disease and coronary artery blockage; there may be narrowing of the coronary arteries that has yet to cause heart muscle damage. An abnormal EKG may be a "normal" variant for that patient and the result has to be interpreted based upon the patient's circumstances. If possible, an EKG should be compared to previous tracings looking for changes in the electrical conduction patterns. It would make sense that during exercise, the heart is asked to work harder and if the heart could be monitored and evaluated during that exercise, a test might uncover abnormalities in heart function. That exercise may occur by asking the patient to walk on a treadmill or ride a bicycle while at the same time, an electrocardiogram is being performed. Medications (adenosine, persantine, dobutamine) can be used to stimulate the heart if the patient is unable to exercise because of poor conditioning, injury, or because of an underlying medical condition. Ultrasound examination of the heart to evaluate the anatomy of the heart valves, the muscle, and its function may be performed by a cardiologist. This test may be ordered alone or it may be combined with a stress test to look at heart function during exercise. A radioactive tracer that is injected into a vein can be used to indirectly assess blood flow to the heart. Technetium or thallium can be injected while a radioactive counter is used to map out how heart muscle cells absorb the radioactive chemical and how it is distributed in heart muscle cells may help determine indirectly whether a blockage exists. 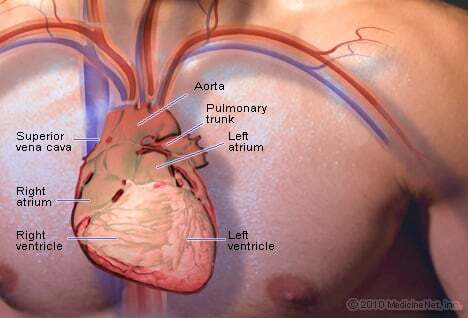 An area of the heart with no uptake would suggest that the area is not getting enough blood supply. This test may also be combined with an exercise test. Using these scans, the anatomy of the coronary arteries can be evaluated, including how much calcium is present in the artery walls and whether blockage or artery narrowing are present. Each test has its benefits and limitations and the risks and benefits of considering a CT or MRI depends upon a patient's situation. Cardiac catheterization is the gold standard for coronary artery testing. A cardiologist threads a thin tube through an artery in the groin, elbow, or wrist into the coronary arteries. Dye is injected to assess the anatomy and whether blockages are present. This is called a coronary angiogram. If a blockage exists, it is possible that angioplasty may be performed. Using the same technique as the angiogram, a balloon is positioned at the site of the obstructing plaque. When the balloon is inflated, the plaque is squashed into the wall of the artery to re-establish blood flow. A stent may then be placed across the previously narrowed segment of artery to prevent it from narrowing again. The goal of treating cardiovascular disease is to maximize the patient's quantity and quality of life. Prevention is the key to avoid cardiovascular disease and optimize treatment. Once plaque formation has begun, it is possible to limit its progression by maintaining a healthy lifestyle with routine exercise, diet, and by aiming for lifetime control of high blood pressure, high cholesterol, and diabetes. An aspirin may be used for its antiplatelet activity, making platelets (one type of blood cells that help blood clot) less sticky and decreasing the risk of heart attack. The decision to use aspirin routinely depends upon whether other risk factors for heart disease are present. Should there be significant stenosis or narrowing of the coronary arteries, angioplasty and/or stenting (described above) may be considered to open the blocked areas. These procedures are performed in conjunction with cardiac catheterization. Depending upon the patient's anatomy and the extent of the blockage present, coronary artery bypass graft surgery (CABG) may be required. If a stent is placed, other antiplatelet medications like clopidogrel (Palvix) may be prescribed. It may take 10 to15 years from the beginning of a plaque formation in a coronary artery to narrow that artery to constrict blood flow. The American Heart Association and the American College of Cardiology have developed guidelines so that health-care professionals may counsel and treat their patients to decrease the risk of developing heart disease. New attention is being paid to the role of weight reduction, diet, exercise, and the use of cholesterol-lowering medications called statins. In the past, the goal for statin drugs like atorvastatin, was to lower the blood cholesterol level to a specific number and statins were prescribed for patients with high cholesterol levels or those who had had heart attacks. The new guidelines recommend that more patients may benefit from these statin drugs. Rather than having specific cholesterol numbers as a goal, the new goal is to lower the blood cholesterol level by 50% in high-risk patients and by 30% to 50% in those who are at lower risk to develop heart disease. You and your doctor should discuss which goals are best for your condition. Patients with a history of heart attack, transient ischemic attack (TIA), or stroke, statins may be appropriate for patients with high LDL cholesterol levels (the “bad” cholesterol), for example, those who have type 2 diabetes, and those who have a 10-year risk of heart attack greater than 7.5%. You and your health-care professional may estimate risk by using the American Heart Association and American College of Cardiology's ASCVD (Atherosclerotic Cardiovascular Disease) Risk Calculator. Preventing cardiovascular disease is a lifelong commitment to control blood pressure, high cholesterol, quit smoking, and diabetes. Now, new opportunities exist to decrease risk even further with these new guidelines. These are also the steps to take to decrease the risk of stroke and peripheral artery disease. Which specialties of doctors treat heart (cardiovascular) disease? Cardiologists are specialists who treat cardiovascular heart disease. In addition to confirming the diagnosis using a heart catheterization, they often are able to perform angioplasty to dilate or open a narrowed or blocked artery and restore blood supply to heart muscle. As well, cardiologists help manage patients with chest pain to minimize the risk of future heart muscle damage. Cardiothoracic surgeons operate on the heart and perform coronary artery bypass surgery, if the coronary arteries are severely blocked and the patient is not a candidate to have angioplasty. These surgeons also repair or replace heart valves and perform other surgeries that involve the structure of the heart. Primary care practitioners, including those in family medicine, internal medicine specialists and women's health, often help make the initial diagnosis of heart disease and are able to manage stable patients who do not need invasive procedures or interventions. These providers are also work to help minimize potential risk factors for heart disease, so that it does not develop, or if it is already present, to minimize progression of the artery blockages. Emergency physicians often make the diagnosis of angina when a patient presents with symptoms of heart disease. As well, when patients present to the ER with symptoms of a heart attack, they work as a team with the cardiologists to treat the patient quickly to restore blood supply to dying heart muscle. An estimated 15.5 million people in the United States have coronary artery disease. Each year, 1.5 million patients suffer an acute myocardial infarction and more than 600,000 people die. With better understanding of the different signs and symptoms of heart disease, especially the "atypical" symptoms experienced by women and the elderly, the diagnosis of heart disease has improved. The prognosis for the patient is better when diagnosis and treatment are initiated early. Educating the public about early access to emergency services when a patient develops acute chest pain can help save lives. The goal for the treatment of heart disease is to maximize longevity and quality of life. Arnett, D. K., et al. "AHA/ACC/HHS Strategies to Enhance Application of Clinical Practice Guidelines in Patients with Cardiovascular Disease and Comorbid Conditions." Circulation 130.18 (2014): 1662-1667. Bamberg, F., et al. "Meta-analysis and systematic review of the long-term predictive value of assessment of coronary atherosclerosis by contrast-enhanced coronary computed tomography angiography." Journal of the American College of Cardiology 57.24 (2011): 2426-2436. Centers for Disease Control and Prevention. "Coronary Artery Disease (CAD)." Updated: Aug 10, 2015. Centers for Disease Control and Prevention. "Heart Attack Signs and Symptoms." Updated: Aug 05. 2015. Centers for Disease Control and Prevention. "Health, United States, 2015: With Special Feature on Racial and Ethnic Health Disparities." Centers for Disease Control and Prevention. "Leading Causes of Death." Updated: Oct 07, 2016. Greenland, P., et al. "2010 ACCF/AHA guideline for assessment of cardiovascular risk in asymptomatic adults: a report of the American College of Cardiology Foundation/American Heart Association Task Force on Practice Guidelines." Journal of the American College of Cardiology 56.25 (2010): e50-e103. Please share your experience with heart disease. What signs and symptoms have you experienced with heart disease? If known, what has caused your heart disease? What natural, lifestyle changes, medications, or surgery have you had for heart disease? Have they been effective?